Wreathes and Tombs and Hearses | SPACE-BIFF! Very few games strive to be this evocative. Firstly, there’s a game out there called Hanabi, about putting on a fireworks show. Everyone gets their own set of fireworks cards, across various colors and numbers, and between them they must arrange these fireworks in their proper order. This is trickier than it sounds. Each player holds their hand of cards backwards, facing everyone else, and they may only communicate in response to particular questions, such as how many of a certain color they are holding. The rest of the time, they must be silent. Secondly, on 7 January 2015, a pair of brothers attacked the Paris office of satirical newspaper Charlie Hebdo. The brothers, outraged over the newspaper’s lampooning of the prophet Muhammad, killed or wounded over twenty people before escaping. One of the victims of this shooting was cartoonist Bernard Verlhac, better known by his nom de plume, Tignous. The connection between the two comes in the form of a card game. The Grizzled (or Les Poilus, if you speak French) was illustrated by the late Bernard Verlhac, and portrays a group of inseparable young friends thrust into hell itself. Mobilized in 1914, they’re less concerned with the grand sweep of the war, or taking possession of the next row of trenches, or which royal family rises to the top of the devastated heap. Rather, their only goal is to help each other survive. To endure gas attacks, mortar shellings, the murderous cold of winter and the impenetrable dark of night, to lend a hand when someone loses their nerve or gets hurt. As best of friends, they survive or die together. And, as with Hanabi, it’s a game that permits very little communication. At first glance, it might not make much sense to prohibit open discussion in a game about friends helping each other through the terrors of war. Wouldn’t it make more sense for a band of brothers to touch base as constantly as possible? To establish that, hey, maybe Anselme shouldn’t go on this next mission because he gets jumpy every time a whistle blows? Certainly, some games have enforced strict no-communication policies and suffered thematically for it, as with a particular relationship simulator that ordered its conversation-starved couple to stop talking. The Grizzled, however, uses its theme of silence to elevate the entire work. The result is a game about the unspeakable fears that accompany the constant threat of death, and the ways that men — and, in this case, the men of a particular era — express their affection, support, and solidarity. I’m not going to spend much time talking about how the game itself works. In short, each round revolves around a mission, everyone given a hand of cards and told to get rid of as many as possible. 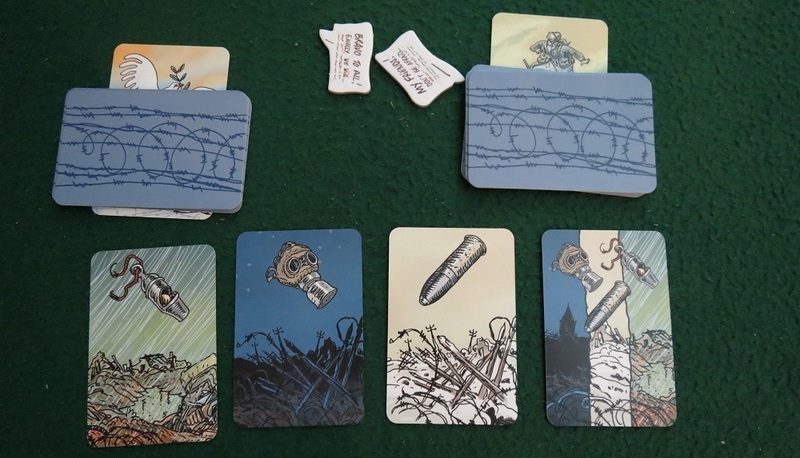 Most of the time, getting rid of a card means putting it in the middle of the table, where its symbols (an artillery shell, a gas mask, a whistle, night, rain, or snow) threaten to add up and end the mission in failure, especially when “traps” bring out entirely new cards from the deck. Other types of cards are placed beside your character, representing the accumulating ailments of their weariness. All but a single one of these are distinctly non-visible. The rest revolve around wounds unseen. Your group of friends is forced to endure devastating indignities, becoming fragile, clumsy, mute, demoralized, or panicked. Phobias and traumas develop. Missions are threatened when someone becomes absent-minded or selfish. The implications of these subtle injuries are twofold. First of all, it’s soon apparent that the symbols don’t necessarily represent actual combat missions so much as they do the oppressive foreboding of every single moment. A newly revealed whistle doesn’t always mean your group has survived yet another charge over the top; rather, it might mean they’ve lived another month with the neverending fear that their unit will be the next one sent to face the roar of the machine guns. And secondly, as was the case with so many of the men who lived through the war, you simply aren’t allowed to talk about it. Sure, there’s room for the occasional speech, a little word-bubble that can vacate an entire closet’s worth of apprehensions in a single sweep. But these moments are rare, occasionally of no consequence, and all too fleeting. Most of the time, your options for handling the swelling tide of dangers and traumas are severely, distressingly limited. It goes without saying that The Grizzled is a very difficult game to beat. This isn’t to say you’re entirely without hope, just that each player is forced to endure constant uncertainty, follow their intuition, give comfort where possible, and hope that everyone else is on the same page. These are men of action, and through their actions they’re given a voice. A cup of coffee, a blanket over somebody’s shoulders, a shared memory of home — these are the vocabulary with which they may speak. In game terms, this means pointing one of your support tiles towards a character who needs your help. Sometimes you won’t be able to reach everybody, and sometimes a mission will end in failure and render your acts of compassion far less effective. In those moments, it’s up to your comrades to pick up the slack. Your friends might suffer in silence, but it’s your goal to ensure they never suffer alone. The irony is profound, but too terrible to speak. The Grizzled is fantastic, and not only because the game portion is actually pretty damn solid. It’s the sort of game that strives to complement literature, to say something profound about the maddening tension of war, the silence we inflict upon ourselves, and the ways men show their support with their hands rather than their voices. It isn’t afraid to inflict terrible wrongs on its characters, to focus its conflict on the hidden interior spaces where everyone is vulnerable. But it also isn’t above offering hope, a light at the end of the dark wet road, no matter how faint. Posted on October 18, 2015, in Board Game and tagged Board Games, Cool Mini Or Not, Les Poilus, Sweet November, The Grizzled, Why Games Matter. Bookmark the permalink. 13 Comments. This review bummed me right out. But in a good way? I have to try this game. Right here, this is why I come to Space-Biff!. 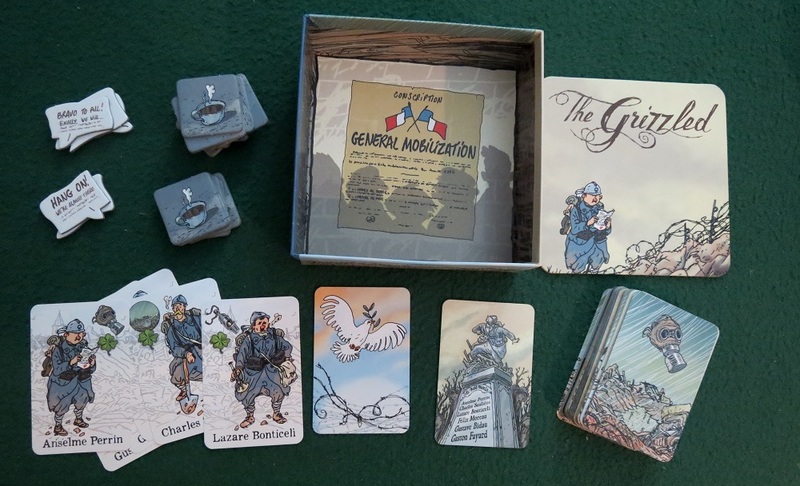 I’ve only played The Grizzled once, but that was enough to understand how it was using silence to heighten the uncertainty and reinforce how unpredictable life for a soldier of the Great War would have been. Obvious enough. But that second reading, about shell shock, hidden hurts, and the stigma against confronting all those “unmanly” injuries… I can absolutely see it now, but I don’t think I would have without this analysis. Very well done. I’ve got to say, this really is an awe-inspiring piece of writing. There are so many ways to make a game work. Not everything is a social experience, at least not in the sense that everything has to be about getting together with friends and telling jokes. I can’t wait to get my hands on this. What I like about this versus other reviews of The Grizzled is that nearly everyone else is focusing almost entirely on the difficulty of the game. Here, the difficulty gets one line. Just one. Nearly every cooperative game is difficult, otherwise what’s the point? So instead of belaboring the point, Dan just states the obvious and gets on with explaining what makes the Grizzled COMPELLING. I applaud the intentional omission of your usual flippant mouseover text to emphasize your point about limited communication and to keep the review on a serious.note. One of your best reviews yet. I couldn’t thumb or tip geek gold here so I went over to BGG to do so. Point me to a tip jar or patreon account and i’ll add to that as well. Damn fine writing! Thanks for your kind words, Lee! Pingback: Best Week 2015, Consternated! | SPACE-BIFF! Pingback: Mud, Smoke, and Friendship | SPACE-BIFF! Pingback: This War of Nobody’s | SPACE-BIFF! Pingback: Mind Games | SPACE-BIFF!